To order a printed copy of the Best of British Touring & Holiday Parks brochure, simply click the Request button below. You can download the Best of British Touring & Holiday Parks Brochure instantly as a digital iBrochure [?]. View the Best of British Touring & Holiday Parks Online Brochure Now! With a wide variety of Best of British parks on offer in locations throughout the UK – all of them of the highest quality and privately owned – you're only a few steps away from finding your ideal holiday park. Whether you want the freedom of taking your own caravan, motorhome or tent, or prefer a choice of high quality self–catering caravan holiday homes or lodges, Best of British parks can provide the ideal location – just check their Parks directory for details. Some of the parks have caravan holiday homes for sale too if you'd prefer the freedom to take regular breaks in your own holiday home. Don't miss out on your perfect holiday – choose a Best of British Park. Best of British Touring & Holiday Parks Brochure Tom G. said: Travelling to England (Cotswold area) this summer to attend sons wedding and will possibly be seeking out one of the holiday parks listed in this brochure to take some extra time with our other children and our grandchildren. Best of British Touring & Holiday Parks Brochure EDDIE M. said: Very informative. 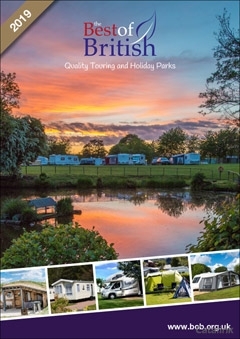 Best of British Touring & Holiday Parks Brochure Vince D. said: Very informative with good descriptions of camp sites..
Best of British Touring & Holiday Parks Brochure William B. said: Perfect for future reference! Best of British Touring & Holiday Parks Brochure Phil B. said: Just got it today. Best of British Touring & Holiday Parks Brochure Malcolm P. said: I found your site very usefull and will continue to use. Best of British Touring & Holiday Parks Brochure Marcia B. said: love the neat size of the brochure, images are good. Best of British Touring & Holiday Parks Brochure David M. said: Interesting selection of vacation venues. Best of British Touring & Holiday Parks Brochure Kinna M. said: Sufficiently detailed information, would have liked more pictures though. Best of British Touring & Holiday Parks Brochure Jennifer G. said: Nice brochure. Best of British Touring & Holiday Parks Brochure Jane D. said: Given me some good holiday ideas. Best of British Touring & Holiday Parks Brochure Eira B. said: good guide to places i havent thought about. By pressing the Request Printed Brochure button you give consent to Best of British Touring & Holiday Parks (and their Data Processors for the specific purpose of delivering your literature) to send you their Brochure .